During UNGA week Convergence and the Center for Universal Education at the Brookings Institute launched the report Impact Bonds in Developing Countries: Early learnings from the field. This is the first report to take stock of the current state of impact bonds in developing countries – who’s doing them and where, the challenges and obstacles they face, and where we need to go from here. While remarkable progress has been made in human development indicators in recent decades, significant global challenges remain. Over 800 million people are living on less than $1.25 a day and 263 million children and young people are out of school. The United Nations’ sustainable development goals (SDGs) outline an ambitious global agenda for ending poverty and hunger, ensuring good health and quality education, and promoting jobs and reduced inequalities. However, governments and multilateral organizations will face considerable challenges achieving these aims. In education alone, the Education Commission in 2016 estimated a funding gap of $1.8 trillion per year to ensure quality education for all children. Achieving the SDGs will require governments and multilaterals to develop and apply innovative financing tools to make the best use of existing funds. Results-based financing represents one tool that governments and multilaterals can use to ensure that funds are directed most effectively toward populations in need. Ensuring that resources are spent only on interventions that achieve desired results has the potential to better target social services and to hold funders and service providers accountable for what they deliver. Social and development impact bonds, one form of results-based financing, have the potential to shift the focus of participants to outcomes, encourage performance management and adaptability, promote learning through evaluation, and create a clear case for investing in what works. 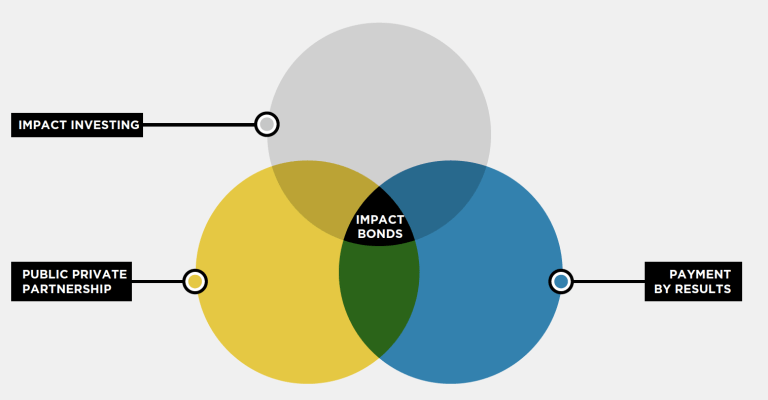 Impact bonds blend impact investing, results-based financing, and public-private partnerships (see Figure 1). In an impact bond, private investors provide up-front capital for social services and are repaid by an outcome funder contingent on the achievement of agreed-upon results. In the case of a social impact bond (SIB), also called pay-for-success (PFS) in the United States and social benefit bonds (SBB) in Australia, the outcome funder is a government entity. In the case of a development impact bond (DIB), “development” referring to their primary application to low- or middle-income countries, this is usually a third party such as a donor or foundation (Center for Global Development and Social Finance, 2013). Since there are only three DIBs with operational experience, much of the analysis of this report focuses on the design and negotiation phases of the impact bond contracting process. While impact bonds are structured in multiple ways, the basic mechanics can be described as in Figure 2. 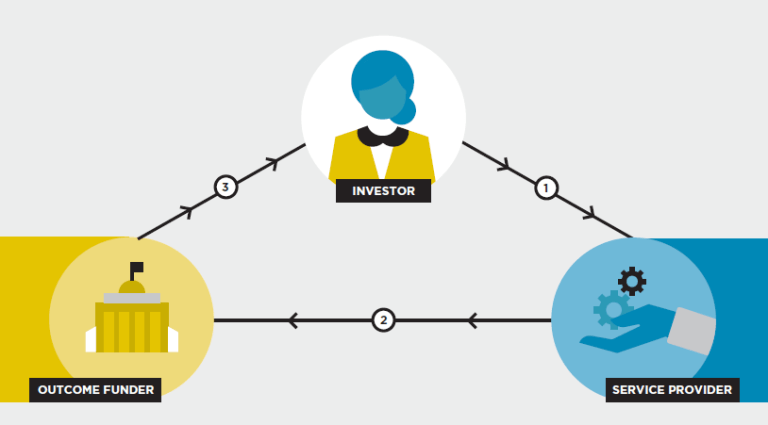 Most impact bonds involve three main types of actors: the investors, who provide up-front capital to the service providers to deliver social services to the population in need. Contingent on the achievement of results, the outcome funder repays the investors their principal plus an agreed-upon return on investment. In 2015, the Brookings Institution published a report on the potential and limitations of impact bonds, which chronicled the development of the first 38 impact bonds in high-income countries and analyzed the landscape. This report takes the field further forward, exploring the lessons learned in the development of impact bonds in low- and middle-income countries, bringing together the findings from interviews with stakeholders and research into the impact bond space conducted by the authors over the course of a year. In addition, the report draws on discussions from an intensive daylong workshop held in London in November 2016, in which impact bond practitioners from developing countries shared their experiences and early lessons learned. The report includes a Deal Book with detailed fact sheets for all impact bonds in developing countries, featuring both the four contracted and 24 in design phases, as of August 1, 2017. The following analysis indicates the wide range of deals in design phases in developing countries, ranging in terms of country, sector, size of returns, and evaluation methodology. Emerging from the analysis, the recorded discussions in a one-day workshop with practitioners, and in-depth interviews with stakeholders from the contracted deals, we have identified five key issue areas in the design and implementation of impact bonds, which the following sections will explore. Identifying appropriate interventions and service providers. Managing relationships with government and donor outcome funders. Identifying metrics and structuring payments. Developing the operating model, structuring the vehicle, and raising capital. This article was first published on the Brookings Institution website. Go to original article.